I used the leftover bone from our Easter ham; it had been refrigerated, so I was able to scrape the fat off it before I put it in the pot. 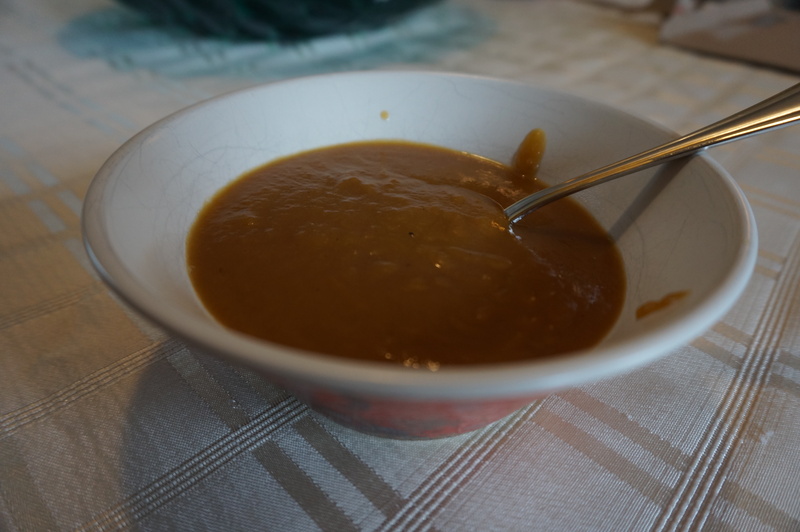 If you are making this soup immediately after cooking a ham, you will have to skim the fat off before making the soup. Place ham bone in deep pot, cover with water. Bring to a boil and let simmer until any leftover meat is falling off. Remove bone and dice up any remaining meat. While the broth is cooking, sauté the leeks in 2 tablespoons of olive oil till softened. Peel and dice potatoes, add them to the broth. Grind some pepper into the mixture. Simmer until potatoes are soft. If you have an immersion blender you can blend it right in the pot, if you use a blender, you will need to do it in batches. And if you have neither, just eat it like it is! Return to pot to reheat. If it is too thin, simmer until reduced, if it is too thick, add some more water. Great with crusty bread or tea biscuits! ← Spiritual? Religious? Creative? Bookworm? Dancer? Baker?